Poly(maleic anhydride 1-octadecene) 1:1 (molar) | Polysciences, Inc.
Alkali-soluble hydrophobic resin. Reacts with amines and alcohols. Soluble in organic solvents such as; acetone, benzene, carbon tetrachloride, decalin, dimethylcarbitol, ethyl acetate, methyl isobutyl ketone and 1,2-dichloroethane. Insoluble in alcohols such as ethanol and propanol. Will slowly dissolve as esterification of the anhydride occurs. 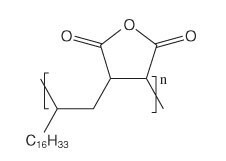 The water soluble dipotassium salt of the polymer can be prepared by slowly adding Poly(maleic anhydride 1-octadecene) to a 30 weight percent solution of aqueous potassium hydroxide at 85º C with stirring and heating at 85º C for several hours forming a light yellow solution with pH ~12. The solid dipotassium salt can be isolated by diluting with water and precipitating with methanol.